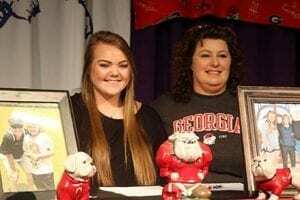 Gilmer High School had the opportunity to witness a historical day on Friday as Senior Sarah Mosley put pen to paper in the signing of her National Letter of Intent and play softball for the University of Georgia. Mosley, as her family, is a born and bred Gilmer resident. She has dedicated her entire life to playing the game of softball since an early age and has excelled at every level. Coach John Stewart started coaching Mosley at age 10 and has continued to this day. 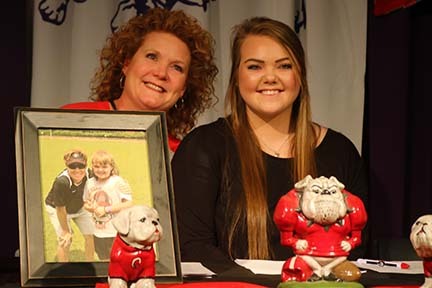 Coach Stewart stated that just one example of Sarah facing adversity in her life was that UGA almost refused to give her an offer for a scholarship. At a huge tournament in Colorado, a coach of UGA made the comment that they didn’t think that Mosley could hit at the college level. With a little unbelief, Coach Stewart ask for them to keep watching Sarah. Mosley proceeded to hit a home run off the #1 team in the nation. The UGA offer was re-examined and the offer was made. Another adverse that Sarah has had to face head-on was the passing of her father in August of the 2017 season. It was both Sarah’s and her father’s desire for her to play college softball at her favorite university. Mosely made the comment at an early age ” I’m going to play at the University of Georgia” and today it came to fruition. With friends, family, and fellow teammates, Sarah Mosley stepped to the table with pen in hand to finalize her childhood dream. As a shortstop for the Gilmer Lady Cats, #33 was a four-year starter and has several accolades. to her credit. In Mosley’s freshman year she earned 1st Team All-Region honors as a part of the GHSA Sweet 16 team in the State Playoffs. Mosley also was 1st Team All-Region in her senior year as well. Sarah’s junior year was a part of the Georgia All-State Team and voted the 6AAAA Player of the Year by the coaches in the region. 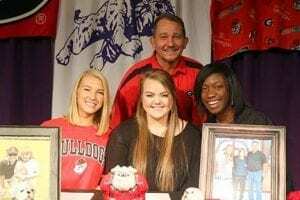 Making the decision to play for the Lady Bulldogs and wear the red and black was an easy one even with some very good schools showing interest. To name a few, North Carolina, LSU and Georgia Tech were vying to get Sarah in their programs to no avail. Mosley wasn’t going anywhere once the UGA offer came through. Congratulations to Sarah Mosley on her NLI signing and the advancement of both her education and softball career at a D1 school. 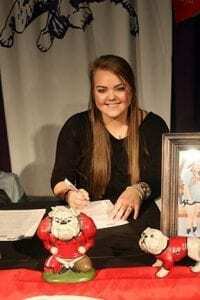 This scholarship is the first for a Gilmer Lady Cat to an SEC or ACC school since 1978. A Historical day and the beginning of a well-deserved future for a hard working young lady.